For the past several years, our Brownie Unit has taken a different approach; instead of focusing on Christmas, or going completely secular with a “Winter” theme, we decided that since most cultures around the world have celebrations in November, December or January we could turn this party into a learning opportunity. Our Unit is lucky enough to have four dedicated leaders (a luxury we do not take for granted!). Each year, we each find a celebration (religious or secular) from a culture most of our girls are not familiar with – any tradition or celebration in November, December or January. We print out maps of the featured countries, prepare a short description of the celebration and its meaning/traditions, and come up with a special food and either a craft or game for each one. For example, in past years we have looked at Diwali, Saint Nicholas’ Day, Yule, Hanukkah, Chinese New Year, Santa Lucia Day, and Japanese New Year. We have created paper “lanterns”, ate Mochi (sweet rice dumplings), pomegranates and dried apricots, filled the girls’ boots with chocolate coins and treat bags to replicate a visit from Sinterklaas, and played lots of new games! The best thing – the girls ADORE this party. They love learning about new celebrations, and the discussion often prompts them to talk about their own holiday and cultural traditions. No one, it seems, misses the old Christmas party one bit! – For older girls, it would be great to have them work in groups and research holidays to present to each other. – If your Unit has access to a kitchen (ours doesn’t) it would be really fun to actually make some special foods. *Yalda picture description: The girls are listening to Snowy Owl tell them about Yalda (the Persian Winter Solstice celebration), while their feet and knees are covered by a large round blanket representing the korsi, a short table covered by a blanket with a heat source underneath. Families sits at together, covering their feet and knees under the korsi, while they share food and read poems and stories all night. By Guest Blogger, Guider Kristy Martin (Tawny Owl), 25th Ottawa Brownies. Kristy has been working with the 25th Ottawa Brownies for six years. She works for a company that creates educational websites and games for cultural institutions, and loves to extend this into writing stories, plays and planning interactive activities for the troop. 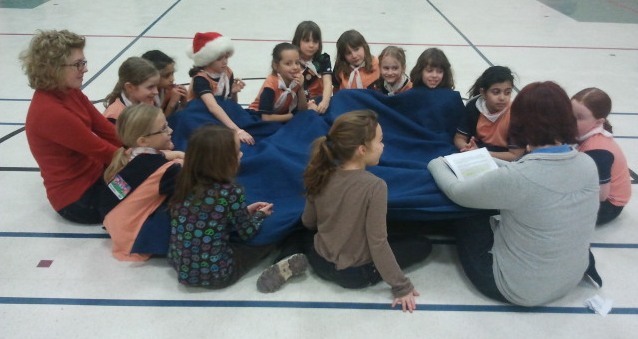 Read her previous post on GirlGuidesCANBlog: This Guider Asks, and Guides and Scouts: Awesome in their Own Ways. Sounds like fun and everyone learns something new! Our unit often has a multicultural night and everyone brings somthing to share from their own background and tells about their traditions. Then we have a feast with all the different foods of the world. We will work on the Special Days Badge then and have guests come and tell us of their childhoods in different countries. We are doing a winter holidays theme in a few weeks, thanks for the ideas!